Surely Emily's punctuation and whimsical thought ran deep within her, leaving her readers wondering the beauty of her thoughts, so duly critized by those who do not understand the unique abilities of a poet's psyche. Indeed this was a lovely one. Ah Emily, such precision, every word 'on point' . 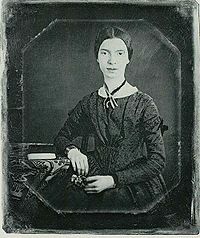 . . some think of her as the mother of twentieth century American poetry and ole Walt as the father. Thanks to Jayne for the diversity of her readings and selections.